Meridian is a bit of a Swiss Army app for all things time. It allows you to create custom alarms, time-zone clocks, and stopwatches that can be reused and reconfigured quite easily. You can even create nonce events that happen at some time in the future. You also get some nice display options, allowing you to choose how and where your alarms and clocks live -- in a floating window, on the Desktop, under a pulldown menu, etc. Also, in case you're getting sick of "Basso" farting your reminders at you, you get some lovely new alarm sounds to choose from (I like "Ventana"). 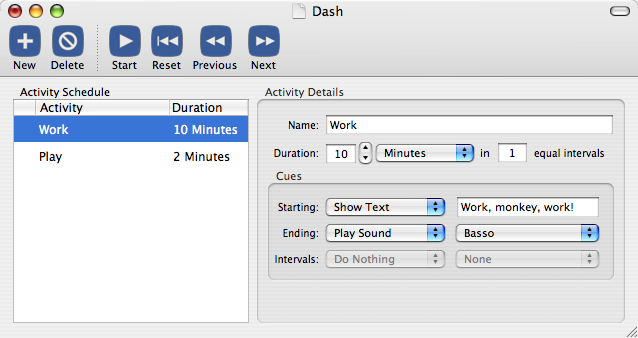 I also like that the floating windows for timers and stopwatches afford a variety of actions and access to Preferences right from the teeny little window. It's also easy enough to double-click any window or clock and jump right to the Preferences and configuration options. Handy. Meridian can be configured to pop up a notification window, which, thoughtfully, allows snoozing, although -- same beef I have with iCal -- I wish the snooze options were more varied and configurable. Also, it would be nice to have access to starting a different alarm right from the reminder window. 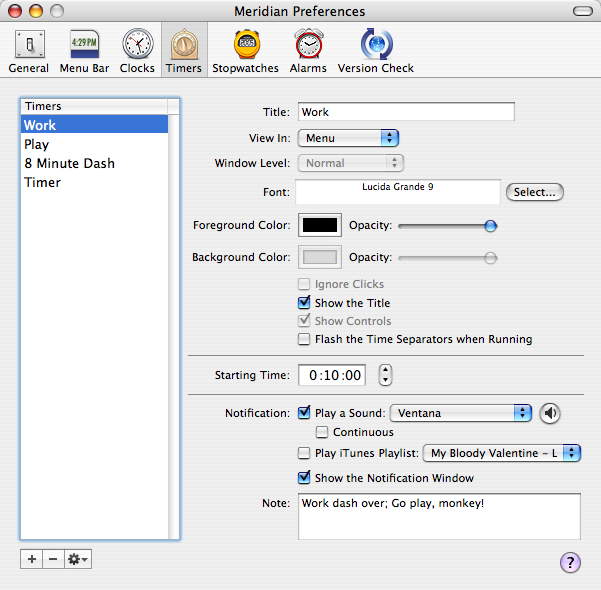 Meridian is a good option for running dashes and alternating work/play cycles, although it does require you to manually click each alarm session to start -- I'd love a way to "daisy chain" and loop cycles of alarms, something that our next app, "Flextime," seems to do fairly well. Meridian is $19.95 shareware and comes with a 30-day trial. Manage the work/play/break ratios for the time you spend at the computer. Practice a stretching or martial art regimen such as Yoga or Tai Chi. Set up a metronome for rhythmic exercises such as dance or music. Arrange for scripts to be run at regular intervals throughout the day. Just about anything that follows a schedule! This is accomplished by creating a "Routine" that can be saved as a document for reuse. You set up each of the timed events and how you like to be notified, and then let 'er rip. I love that the default option is to repeat the Routine. One less thing to think about and fiddle with. Although I haven't had time (and frankly lack the skillz) to experiment with scripting, it appears that you can associate custom AppleScript events with each alarm starting or ending. Would love to hear how people are using this (and maybe see the sorts of scripts you're building). While it currently offers a fraction of the configuration options of Meridian -- for example, you have to make the Sophie-like choice between a text notification OR a sound OR a script etc. -- Flextime should be an attractive app to watch as it matures. The developer has some interesting plans for post 1.0 (Growl integration, print support, and, via email, functions like sticky alarms), and he seems to get how people might want this app to behave. Flextime is a beta app that is AFAIK free (as in beer); not sure what the post 1.0 license and cost will be. Got a Mac alarm you're loving these days? What are you using to run timed dashes?